At Hopkinsville Electric System, our goal is to keep the power on 100% of the time. However, circumstances beyond our control sometimes cause the power to go out. If your power goes out, please call us to let us know. If the phone is busy, we are most likely already aware of the outage because we receive hundreds of calls during an outage. We will do our best to post outage information to our Facebook page and activate the orange alert bar on our website to keep you informed. Once you have informed us of your outage, additional phone calls are unnecessary. To report an outage, call us at (270) 887-4216. During an outage, our repair work is prioritized by the number of customers each repair will restore power to. 1.Remove any public safety threats, such as downed power lines on the street or ground. 3.Repair major three phase lines that serve critical loads such as hospitals, water & sewer facilities, police & fire stations, etc. 4.Repair single phase lines that serve subdivisions and residential customers. 5.Repair individual service lines going directly to homes or businesses. IMPORTANT INFORMATION: During a severe rain, wind or ice storm, is not uncommon for the electric service mast on a home to be damaged. If the service mast is damaged, it is the property owner’s responsibility to have the service mast repaired by a licensed electrician before HES can reattach the electric service line and restore power. 1.Do I need to call HES to report my outage? Yes, you may call us to report an outage. However, if our line is busy, it is because we receive hundreds of calls during an outage. It is highly likely that one or more of your neighbors have already called to report the outage. In addition, our new electronic meter system allows us to see each home that is without power. 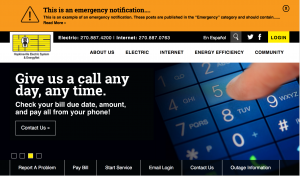 Once we are aware of an outage, we will enable the orange alert bar at the top edge of our website and post the outage information on our Facebook page. 2.Why can’t you tell me how long it will be until my power is restored? It is always our goal to restore power to our customers as quickly as possible. For most small outages, power can usually be restored within 2 hours or less. However, after a major storm, damage to the electric system can widespread and comprehensive. In these cases, our crews typically work 14-16 hour days to repair the electric system. However, restoring power to a neighborhood may require multiple repairs to restore the path the electricity takes to reach your home. For this reason, it is difficult to estimate the exact number of hours all the necessary repairs will take. Rest assured that our entire crew works long hours until the last customer’s power has been restored. 3.What should I do if a major storm causes widespread outages? If it is apparent that your power may not be restored for days, you may need to take steps to protect your health and safety. Customers requiring electricity for medical devices may need to relocate to another house or facility that has power until their electric service is restored. You may need to consider steps to preserve refrigerated and frozen food. During winter, it may be possible to store frozen foods outside until power is restored. During summer, it is best to not open freezers if possible to maintain the lowest temperatures in the freezer. 4.Why are my neighbor’s lights on but not mine? It is important to first check your fuse or breaker box to see if a fuse is blown and a circuit breaker has tripped. If this is not the problem, the next step is to check the service line from the pole to the house. If this line is damaged, contact HES to request a repair. If the electric service mast on your house has been damaged, it must be repaired by a licensed electrician before HES can reconnect power to it. If the service line to your house is underground, it is very unlikely that it has been damaged. It is also possible that your neighbor’s house receives electricity from a different primary line than your house. 5.Why have HES trucks passed my house but my power still isn’t on? One of the first steps to power restoration during an outage is to identify the problem. There are times when our lineman drive an electric circuit while looking for the problem. It is also possible that the problem has been identified and your house happens to lie along the path they take to reach the problem. Rest assured that if you see our trucks in your area, our crews are working diligently to restore your power as quickly as possible. 6.What is my best source of information during an outage? HES will post information to the HES website and Facebook page as quickly as possible to keep our customers informed during an outage. Our new electronic meters allow us to determine exactly which houses are without power during an outage, so it is unnecessary to inform us multiple times that your power is out. Please be patient and realize that our linemen typically work 14-16 hour days during widespread outages.